Here's an image I picked up from Guru Huky at Guru's Blog. The translated title of Guru's post is "A German, a Greek, and the IMF Designing a Rescue". 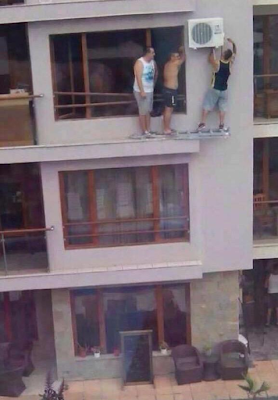 This is humorous but not quite Darwin Award material. (2 March 2014, Netherlands) Two intoxicated men dared each other to test their courage against an intercity train at a Rotterdam train station. At 1800 hours on a Sunday evening, the station was crowded with more than 300 fans returning from a soccer-match pitting Feyenoord against Ajax at De Kuip, the most beautiful soccer stadium in Holland. The two men stepped off the platform and strode forth onto the tracks. One superdaredevil lay down between the tracks, intending to prove that the entire train would pass over him. What a story to tell! His friend was less confident and he merely knelt down next to the track and kept his head as close as possible to where he thought the train's profile would be. Turns out that the 130 km/h train that came down the track some seconds later was both lower and wider than they thought. They were killed instantly. The 300+ onlookers on the platform were none too pleased by the spectacle, and train traffic was interrupted for several hours while authorities cleaned up the mess. Also consider "The Ring Thing" and "Natural Birth Control", the latter was another double-Darwin award. A nice 2013 Darwin Award winner involves an Elevator Death in which a man forced open the doors of an elevator on the 7th floor, jumped out to the cables to slide down, and died in the ensuing crash. His estate filed a losing lawsuit against the elevator manufacturer after exhuming his body 18 months later. The person in question had voluntarily swallowed a mix of decision-impairing substances bringing his BAC [blood alcohol concentration] to 0.17% with a Xanax chaser. Unfamiliar with Xanax, this writer thumbed through the Urban Dictionary and found Xanax described as one of the more addictive benzos with withdrawal effects including psychosis and epileptic-type seizures. As readers may have guessed, men are far more likely than women to win Darwin Awards.